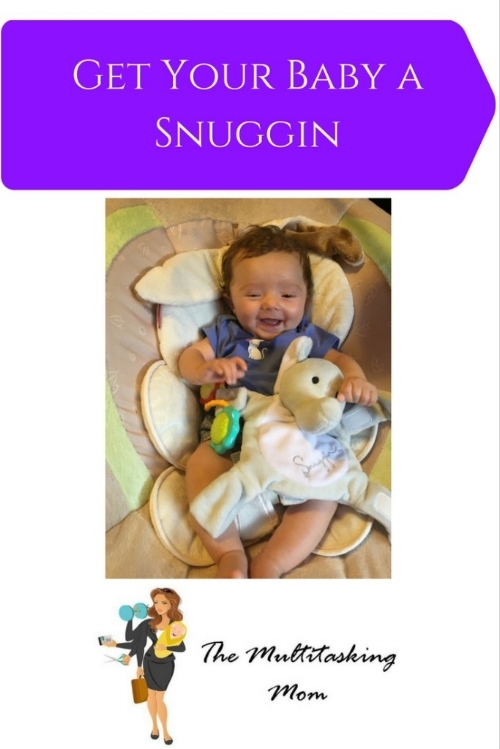 I was recently contacted by the company that created the Snuggin to review this super cool toy. They provided me with one of their adorable little Snuggins to test out with Hailey girl. If you have never heard of a Snuggin, I am here to tell you all about it. A Snuggin is a cute little elephant unstuffed animal who's practical use goes far beyond what you'd expect. Perfect for any baby in your life. First off, the Snuggin is an adorable little elephant. The material is soft and plush and perfect to cuddle with. I sometimes catch Hails just rubbing her face against it. The trunk and ears are perfect for little hands to grasp. Hails is also prone to putting her little elephant into a head lock.... Clearly she watches too much WWE with her dad and brother. The Snuggin comes in blue and grey, so you can pick your preferred color. We chose grey. This little toy has a variety of uses. First off, as stated above, its great to cuddle with. Each of the four legs comes with velcro that can be opened. You can see what I mean in the picture below. This can be used to attach it to pacifiers or toys. Now you will always be able to find your baby's pacifier. This is a life saver when crankiness strikes. When teeth start coming in we will be using this for her teether as well. 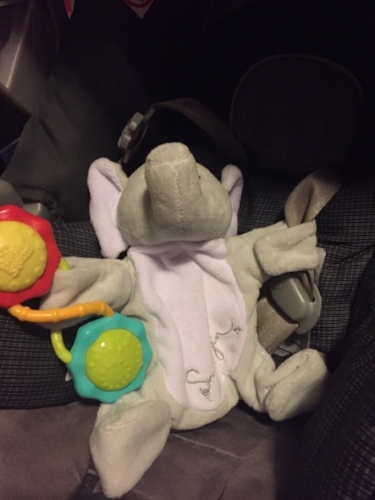 A great feature is that you can attach it to your baby's carrier, car seat, or the straps of her bouncer. No more running after dropped toys because now they are attached to her seat. You can switch out the toys so that your baby is always entertained. The Snuggin can also serve as a trusted friend to your little one and help with separation anxiety. Lastly, your Snuggin has a handy little Velcro pouch in the back. You can use this to store small toys or an extra pacifier. The Snuggin also gives me peace of mind especially when attached to Hailey's pacifier. We have all seen the clips to attach a pacifier to your baby's clothiers so that it doesn't fall. They have saved Hailey's pacifier on numerous occasions. When Hails falls asleep however, I sometimes get concerned that the strap might get caught on her neck. Attaching the pacifier to the Snuggin prevents that concern. There are no long straps to be worried about. The Snuggin has been safety tested and approved which makes me happy to give it to Hails to cuddle with. Because we love the Snuggin so much, we are going to be giving one away to one of you. It also just so happens to be the one year anniversary of this blog, so it's the perfect time for a giveaway! Just follow the link below for a chance to win a Snuggin of your own. This giveaway will be running for the month of August 2016 so feel free to come back for additional entries. If you don't have a baby, give it as a gift! I really hope that you check out the Snuggin. We have really loved it and I'm sure your little one will love it too!